Create an assignment or use an existing one. Grade few students in the assignment. In the course, add the Activity results block. Configure the block and select to display the results of the assignment. The caption is smaller (18px) and doesn't has a border-bottom. The score (grades) are displayed correctly on the right side (check margins). Change the language to Hebrew or other RTL language. Make sure it display correctly on RTL. In a course, with few enrolled students Create an assignment or use an existing one. Grade few students in the assignment. In the course, add the Activity results block. Configure the block and select to display the results of the assignment. Please make sure the block: Displays the information correctly. The caption is smaller (18px) and doesn't has a border-bottom. 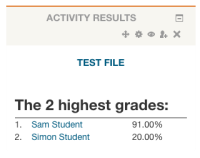 The score (grades) are displayed correctly on the right side (check margins). Change the language to Hebrew or other RTL language. Make sure it display correctly on RTL. This block should override some default css rules. Currently, having 'base' theme as a base, 'caption' has 24px font-size which looks really huge. Also margin-top is set to 1em which is also a lot. Border-bottom also looks a bit outdated and oldfashioned. I propose to alter this to make it look nicer: reduce the font-size, remove margin-top whatsoever, and remove the border-bottom.